With the development of underfloor heating (UFH) floor constructions for retrofit into existing properties, the market for replacing radiator systems is set to grow. This article explores how best to approach the installation and technical aspects that have to be considered. The first thing to do is to speak to a reputable UFH supplier to make sure that the property is suitable for UFH. They will be able to discuss potential floor constructions based on insulation levels, the building’s structure, the heat source and how the occupants will use the system. The system designer will be able to recommend the ideal combination of floor construction and controls to suit the project and calculate the flow rates that will be needed. Nu-Heat, for example, looks at all building elements (i.e. walls, ceilings, windows) to ensure that not only the desired amount of heat is provided but that the system is also economical and efficient. Boilers need to be sized in line with upgrades in insulation and, to ensure that maximum efficiency is achieved, this should be an integral part of the design element for a new build or complete retrofit UFH system. UFH will work effectively and efficiently with combi, system, conventional boilers fired by gas, oil, or LPG in an existing property. Underfloor heating is particularly noted for its ability to enable modern boilers to work in condensing mode due to the low flow temperatures. This will, of course, improve the system efficiency. Where insulation levels have been increased in line with (or in excess of) current building regulations standards and heat losses reduced, a heat pump can also be used. 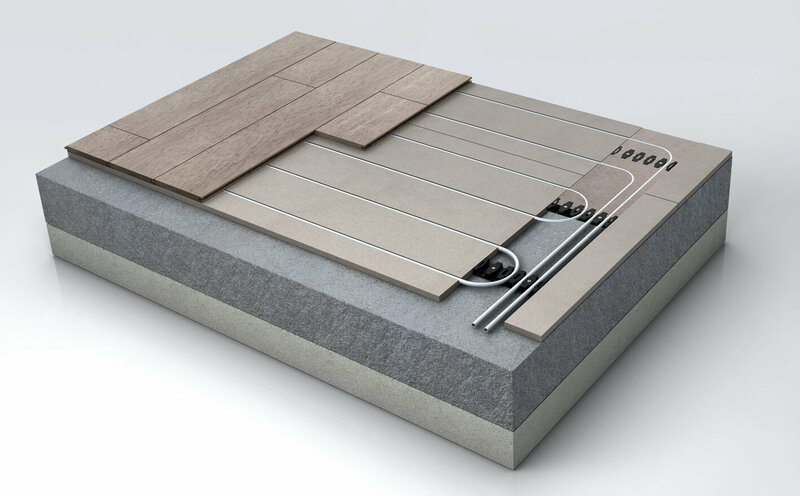 Different UFH floor constructions have different characteristics; for instance, when first switched on a screed floor can take a while to heat up from cold but it will retain the heat for a long time and conduct heat really well, whereas a floating floor with metal diffuser plates will heat up quickly, conduct heat well and then cool down fairly quickly. In either case thermostats can be set to suit the performance characteristics of the floor construction and deliver heat exactly when it is needed. UFH is often considered unsuitable for retrofit due to the issue of floor height build up. However, products such as Nu-Heat’s LoPro10® gypsum-based floor construction offer a practical retrofit solution. LoPro10® has a height of just 15mm and can be installed without needing to remove an existing deck. The floor construction’s low thermal resistance and high-density properties provide a high thermal output compared to similar low height plywood and chipboard based systems. The existing pipework must be checked to determine the system configuration. For new boiler/cylinder upgrades the ideal is the industry-standard S-Plan configuration based on 2-port zone valves and a 12 way terminal strip. For installations with existing W-Plan or Y-Plan layouts the 3-port diverter valve controlling the heating and domestic hot water can be retained as part of the overall system control where valves, pumps and connections for the UFH circuit pipework are conveniently situated; although, in this case, an additional 2-port ‘blocker’ valve should be fitted before the 3-port valve. Alternatively, the system can be upgraded to a standard S-plan configuration, which will also be necessary if independently zoned and timed towel-rail circuits are specified. Existing radiator/hot water time clocks can be left in place but a new control system will be needed for the UFH. Cabling layouts depend on the type of boiler, cylinder and room thermostats installed and a good supplier will provide electrical schematics to illustrate how the UFH control fits into the overall system. As a general rule existing flow and return central heating pipework can be used to supply UFH manifolds where radiators are being replaced (if correctly sized). If some radiators are being retained supply pipes must go to UFH areas and radiator areas separately. 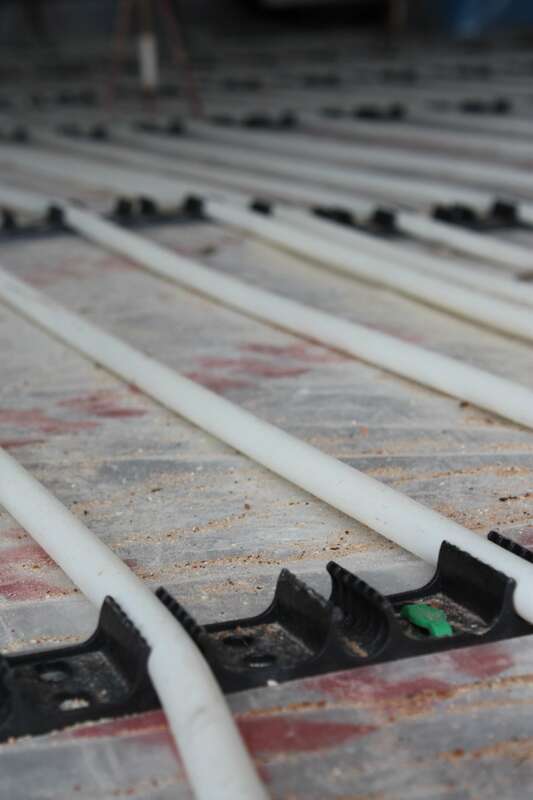 UFH manifolds should always be connected to minimum 22mm flow and return heating pipe, never to 15mm supply pipework. If the overall heating system heat load is to be increased, for example due to the addition of a large extension, then it is important to recalculate the overall heating and hot water load, changing the existing boiler and upsizing the flow and return supply pipework as required. An additional 30% should generally be added to the calculated increase in heating load to help reduce response times between ON/OFF periods. Logically, UFH has the potential to be the most efficient type of emitter. The surface area of the floor is far greater than that of a radiator, allowing the flow temperature to be lower to achieve the same room temperature. Where a radiator may be heated to between 60˚C and 75˚C, UFH can often achieve the same performance running at just 50˚C, which will allow the boiler to operate in condensing mode. UFH is radiant heat rather than the convective heat associated with radiators, so it gives a very different temperature profile; heat is emitted upwards from the floor rather than being carried by convection currents and heating the room from the top down, meaning UFH offers the ideal comfort profile of warm feet and cool head. Nu-Heat has successfully integrated its UFH systems into domestic and commercial new build, renovations and increasingly in retrofit through the use of low profile floor constructions. It is used in a diverse range of properties, from family homes, barn conversions and apartments to offices, hospitals – even castles and tree houses. There are, of course, certain properties that will not benefit from UFH, such as older, poorly insulated properties with high ceilings that will require more than 110W/m², but so long as refurbishment projects undergo an upgrade to their insulation or the property was built within the last 10 years to the insulation requirements of the building regulations, warm water underfloor heating is an ideal option.